If you’ve headed into the new financial year with a good idea of how you’re going to budget for IT expansion or upgrades, you may be wondering how to go about implementing them. Most importantly, we want to ensure that the data is protected, and minimise the risk of hardware failure leading to loss of files, no access to software, and so on. There are five simple steps to follow when planning to upgrade IT. And this proactive approach can save you a ton of money in the long run, as opposed to waiting until something breaks and then rushing (and paying whatever it takes) to get it fixed. There’s no way to know what needs to change, unless you know the state of what you have now. We never make recommendations to fix things that don’t need to be fixed – our goal is to ensure continuity and help you take a staged approach to upgrades that is both affordable and achievable. As part of a staged approach to upgrades, together we can work out what needs to change as a matter of urgency. This might include various parts (such as cabling), devices (laptops, desktops), your server, or your software. If you want to get a finance equipment loan, we can point you in the right direction. It’s also important to remember that equipment under a certain amount is an instant tax deduction. You can chat to your accountant to find out how to make this work best for you. Once we know what you need, we can present you with options depending on what you want to achieve now and across the next 5 years. When you’re running a busy business, and relying on IT to help you deliver for your customers, you can’t just switch everything off in the middle of the day. Depending on what is being upgraded, we will work with you to understand how we can minimise interruptions to your business. If the upgrade also represents change, we will need a plan on how to help train/manage this change with staff. Software upgrades in particular can cause a few teething problems as people get used to the “new way of doing things”, so we want this transition to be as fast and as smooth as possible. Following the plan we have created, we will perform the upgrades and walk you through everything that has been changed. Every time we tick off an upgrade, it should be 4-5 years before you will need to revisit it again. If you become aware of software upgrades that you would like (rather than need) to install in the interim, we can help you make the change. You’ll get the best return on investment with your new IT upgrades if you effectively manage them. For hardware, this can mean a yearly clean to ensure dust does not accumulate and increase the risk of an electrical fire. For software, this can mean performing updates, acting as a helpdesk for employees, backing up data, and securing it against cyberattacks so your information is not compromised. Ask us about our managed IT services, which can help you take care of all of this. Upgrading IT does not need to be a hassle, and with the right IT professional, you can rest assured that it is in their capable hands while you focus on doing what you do best. Remember – a proactive approach to upgrades can save you a lot of time, money and stress in the long run – and give you the confidence that the systems you rely on so heavily to conduct your business will continue to support you! 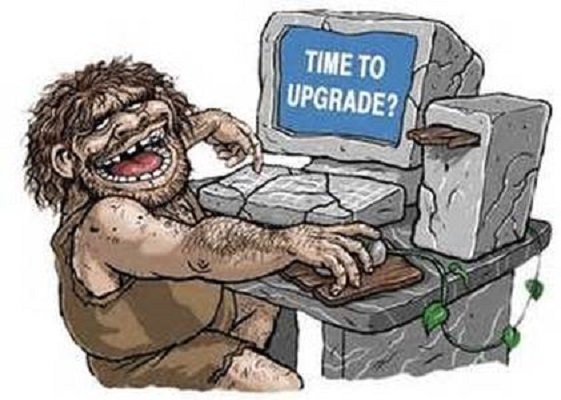 To chat with us about a 5 step plan to upgrading your IT systems, please call (02) 6189 1322 or contact us now.